Home � Disney World Family Activity , Disney World Vacation Planning , Disney World Vacations , Fishing , Golf � 29 Disney World Activities Without Going To A Theme Park! 29 Disney World Activities Without Going To A Theme Park! There is an amazing array of activities to do at the Walt Disney World Resort that do not involve tickets to the 4 major theme parks (Magic Kingdom, Epcot, Disney's Hollywood Studios, or Disney's Animal Kingdom) or the 2 water parks (Typhoon Lagoon & Blizzard Beach). Whether you are looking for a day or two to take a break from the parks or perhaps an entire Resort Vacation there is still plenty to do. Today we will look at 29 different such activities beyond laying by the resort pool to include in your next Disney World Vacation. Go Surfing! Get a private surfing lesson or be part of a group class of 25 at Typhoon Lagoon's Wave Pool. Call (407) WDW-PLAY for reservations and pricing. Golf at one of the Walt Disney World Resort's 4 Golf Courses. Call (407) WDW-GOLF (939-4653) for tee times and more information. Rent a bike. Rentals of traditional bikes, two person and 4 person surrey bikes are available at most Moderate and Deluxe Resorts, as well as, the Disney Boardwalk area. Go Fishing. There are chartered catch and release fishing excursions and dockside fishing locations at several resorts throughout Disney World. Call (407) WDW-BASS (939-2277) to make a reservation for the chartered excursion. Rent a watercraft. Disney World has a large fleet of motorized and non-motorized watercraft available for rent at various Disney Resorts. These include: Sea Raycers by Sea Ray® boats, sailboats, SunTRACKER® pontoon boats, Boston Whaler Montauk boats or canopy boats , pedal boats, kayaks and canoes. Try the Fort Wilderness Archery Experience. Ages 7 and up can learn how to hold a fire a compound bow in a 90-minute archery program. Reservations accepted up to 180 days in advance. Walk-ups welcome if space permits. Horse and Pony Rides. Go horseback riding as part of your Disney World Vacation. At Fort Wilderness's Tri-Circle-D Ranch you can do just that. Make reservations or get more information at (407) WDW-PLAY. 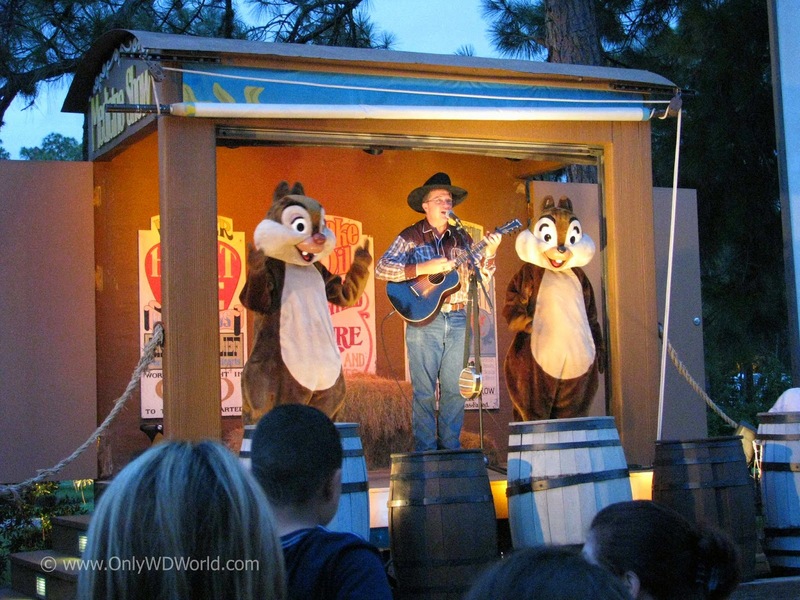 Chip 'N Dale's Campfire Sing-A-Long. Come check out this FREE nightly event at Fort Wilderness Resort & Campground. The Sing-A-Long is followed by a movie shown under the stars. Call (407) WDW-PLAY (939-7529) for movie schedules and times. Send your kids on Disney's Pirate Adventure. Choose from one of 4 different 2 hour pirate adventure hunting for treasure for 4 to 12 year olds. Call (407) WDW-PLAY for Reservations. If you are not into Pirates, how about a Tea Party with Alice in Wonderland. Each day a tea party is held at 1900 Park Fare in the Grand Floridian resort for lunch, dessert, and tea for children ages 4 - 12. Play Miniature Golf at either Disney's Fantasia Gardens or Winter Summerland Miniature Golf Course. Both offer 36 holes of miniature golf like you've never experienced. Go on a horse drawn Carriage Ride. Visit the Port Orleans Riverside Resort for the opportunity to take an intimate 30 minute carriage ride up and down the Sassagoula River. Go Shopping at Downtown Disney. Find merchandise that is exclusive to Disney World at one of several unique shopping locations. Take a Specialty Cruise. Book one of several specialty cruises including ones that provide a wonderful view of either the Epcot Illuminations or Magic Kingdom Wishes Fireworks Displays. Exotic Car Driving Driving Experience. Get your chance to drive a Ferrari, Lamborghini, or Porsche around the world class Exotics course. Call (407 WDW-PLAY for reservations. Richard Petty Driving Experience. Get your chance to drive a NASCAR-style stock car or ride along at Disney World's own on-site track. Go Waterskiing, Parasailing, Wakeboarding, or Tubing at Sammy Duvall's Watersports located at the Contemporary Resort's Marina. Play Tennis. Play tennis or get lessons to improve your game while at the Walt Disney World Resort. See a show at La Nouba. Cirque du Soliel has a permanent show at Downtown Disney to enable you to catch this exciting entertainment. Go on a Resort Tour. Tour one of several Disney World Resorts that provides free tours to learn about the special aspects of the resort. Tours include: Animal Kingdom Lodge, Wilderness Lodge, Grand Floridian, and Yacht Club. Go to a campfire and outdoor movie. Most Moderate and Deluxe Resorts have free nightly campfire and outdoor movie. Go Snorkeling or SCUBA Diving in the Living Seas at Epcot. There are tours (Epcot Seas Aqua Tour & DiveQuest) for each that allow you to be in the large tank at the Living Seas, but Epcot admission is not required. Take the Wilderness Back Trail Adventure Segway Tour at Ft. Wilderness. Tour the trails at Ft. Wilderness on a specially designed Segway. Reserve at (407) WDW-TOUR. Visit an African Savannah. 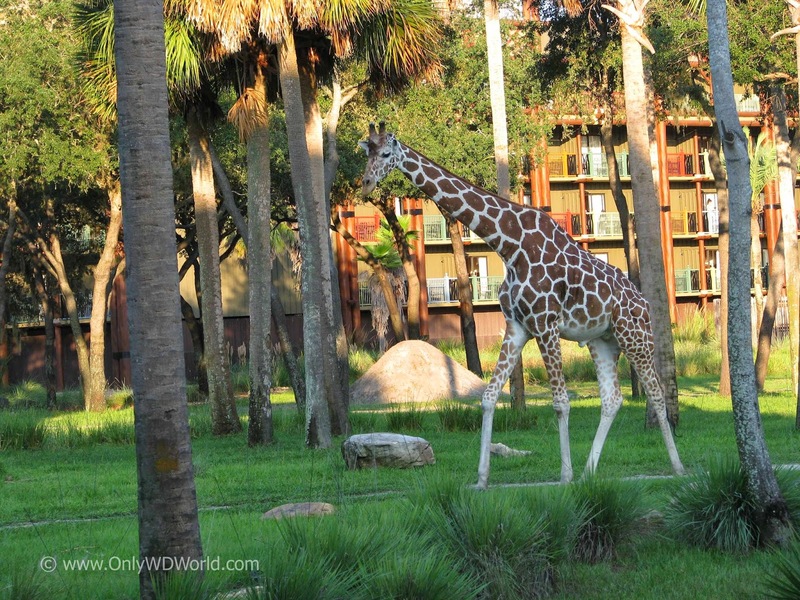 Learn about the Animals at the Animal Kingdom Lodge on the Lodge Savannahs. Visit Jellyrolls. This is the Boardwalk's Dueling Piano Bar that is a wonderful night time experience for Adults. Visit DisneyQuest. This place is the ultimate place for the video game fanatic in your family with traditional arcade games and state of the art virtual reality games. Go Dancing at the Atlantic Dance Club in Disney's Boardwalk. DJ led Dance music with $5 cover charge. Must be 21 or over. See free entertainment on the Boardwalk each night. 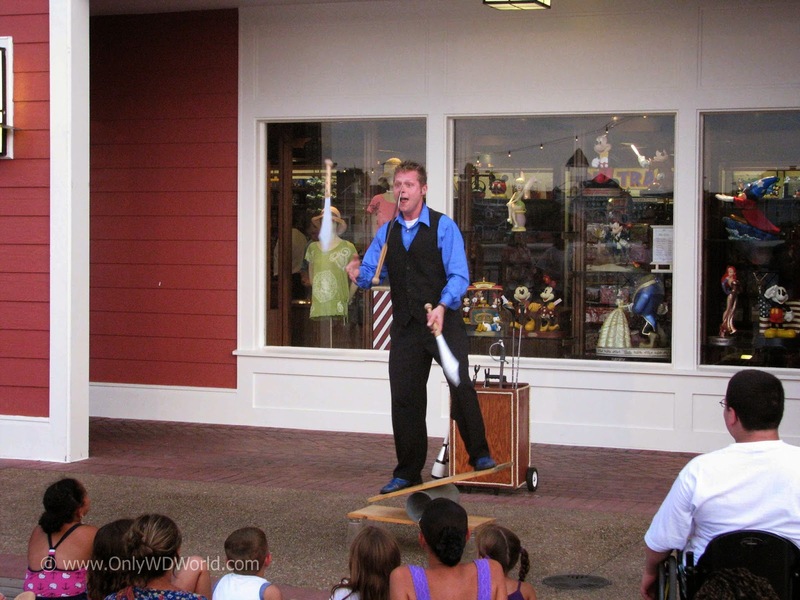 Catch Jugglers, Magicians, and a variety of entertainers performing on the Boardwalk each evening. Pamper Yourself at a Spa. Disney World has two on site Spas. One at the Grand Floridian and the other at Saratoga Springs Resort. Each has a full list of treatments that you can receive to pamper yourself like you deserve. For reservations call (407) WDW-SPAS (939-7727). This list hardly contains everything that there is to do outside of the parks, but it lets you know that there are plenty of options. Unfortunately many of these activities do charge a fee to do them. Plan some excitement into your next Disney World vacation by including an activity that you have never done before. 0 comments to "29 Disney World Activities Without Going To A Theme Park!"